A short 1 minute video clip, which is useful as we are getting a virtual MSM blackout on what is REALLY happening in Eastern Ukraine. These Fascist sh*tehawk pawns of the NWO are not being condemned, or even exposed, by our totally corrupt, sold-out governments and MSM. Interestingly, they are not being condemned by Israel (go figure). More people have been slaughtered by the Ukraine Fascists than have been slaughtered in the latest abominations against Gaza. Who's Telling the 'Big Lie' on Ukraine? Jolly good on yer, Tony! Poor old BBC (British Bull*hit Corporation) and their Corporate Masters must be tearing their hair out! What a pass it has come to, when we have to rely on Russian Media to get a proper perspective on what's going on, not only overseas, but right on our doorstep. Think the deadly events in a civil-war ridden Ukraine are proceeding unscripted, and without US supervision and/or direction? Think again. Below is an excerpt from a formerly confidential memo, leaked by Wikileaks, and authored by former US ambassador to Russia, William J. Burns, to the Joint Chiefs of Staff. The punchline: the memo is dated February 1, 2008. Ukraine and Georgia's NATO aspirations not only touch a raw nerve in Russia, they engender serious concerns about the consequences for stability in the region. Not only does Russia perceive encirclement, and efforts to undermine Russia's influence in the region, but it also fears unpredictable and uncontrolled consequences which would seriously affect Russian security interests. Experts tell us that Russia is particularly worried that the strong divisions in Ukraine over NATO membership, with much of the ethnic-Russian community against membership, could lead to a major split, involving violence or at worst, civil war. In that eventuality, Russia would have to decide whether to intervene; a decision Russia does not want to have to face. So, if Russia does "not want to face" said decision which could and has led to the violence and civil war that is now a daily staple of market-moving newsflow out of Eastern Europe, why not let the US state department force the decision upon Russia? To resolve the conflict in Ukraine, it is highly important to resume the dialogue between Moscow and Washington, as "their role and responsibility is special," first president of the USSR, Mikhail Gorbachev believes. Earlier, Gorbachev stated that Europe may face "terrifying massacre" because of the current crisis in Ukraine. According to him, "too much is at stake; dangers and risks are too high." Mikhail Gorbachev has recently finished working on a new book, which is going to be published soon. The book, titled "After the Kremlin," is devoted to events in Russia and the world over the past two decades. In the epilogue to the book, Gorbachev wrote that the deep cause of what is currently happening in Ukraine was the failure of perestroika and "opportunistic dissolution of the USSR." Gorbachev blamed the then Russian administration for that. "At the same time, I must remind you, the Ukrainian leadership sabotaged the process of transformation of the Union - both before the August 1991 coup and after it, despite the fact that the majority of republics had coordinated the text of the Union Treaty," said Gorbachev. He was fighting to preserve the unified state with all available political tools and offered Kiev to discuss opportunities of creating an economic union, the former Soviet president said. During those talks, he added, one could solve all problems, including the ones on the status of the city of Sevastopol and the Crimean Peninsula. "They did not listen to suggestions and warnings. Having forgotten the fact that one should exercise as much caution as possible in the relations between nations and think through consequences of each step, the Supreme Council of the Russian Federation approved the destruction of the Union to applause. Some would say: "That's a matter of the past." No - the past is through many threads related to present, and it reminds of politicians' mistakes again and again," the first president of the USSR wrote. According to Gorbachev, the only way to solve the Ukrainian crisis is to conduct a constructive dialogue both on the international level and among Ukrainian political forces. "I still believe that for peace in Ukraine, in Europe and in the world, it is vitally important to resume dialogue between Russia and the United States. Their role and responsibility is special," said Gorbachev. According to him, representatives of Moscow and Washington, as well as other members of the UN Security Council, should prepare a joint draft resolution, which would break the negative course of events. In late August, the UN reported that the armed conflict in Ukraine claimed the lives of more than 2,500 people. The military operation against Ukrainian citizens that Kiev calls "anti-terrorist" and Moscow "punitive" was launched in April 2014. On September 4, at the NATO summit in Wales, President of Ukraine Petro Poroshenko said that he was ready to cease fire in the south-east of the country should the meeting in Minsk take place. Later, representatives of the self-proclaimed Donetsk and Luhansk people's republics also declared their readiness to cease fire. Officials at the US State Department said that Kiev should negotiate cease fire agreement with Moscow, rather than with representatives of breakaway republics. However, Russia insists that the crisis in Ukraine is an internal conflict, in which Russia does not interfere. Moreover, Russia and Ukraine are not at war with each other. Mikhail Gorbachev earlier said that Europe may eventually face "terrifying massacre," should the conflict in Ukraine spread to Europe. Gorbachev supports the policy of the Russian administration as far as the Ukrainian crisis is concerned. In an interview with the Russian News Service, Gorbachev stressed out that the Russian Federation must not interfere in the conflict in Ukraine, "If our country interferes, it may trigger the fire that the whole world will not be able to extinguish," he said. "One should do everything to stop killings. This is one nation. If other countries get involved, and the scale of it grows, we can come to the worst massacre in Europe. This must not be allowed," said the ex-president. "Our offer was to open passages and take people out of those mousetraps. Someone sit in warm offices and does the talking. Look at what happens to people, children and women at the same time. They shell maternity hospitals, schools, destroy hospitals," said Gorbachev. As for Russia's move to reunite with the Crimea, Mikhail Gorbachev said that it was a move "to correct the mistake of the USSR." country "with repeated assassination attempts." the true narrative is “USA in Ukraine." documentary that is "produced by Ukrainians." On Thursday, Yatsenyuk made a bizarre claim in an interview with the German TV channel ARD, saying the USSR attacked Ukraine and Germany in 1941. BERLIN, January 9. /TASS/. German government has refused to comment on Ukrainian Prime Minister Arseny Yatsenyuk's allegations regarding the “assault of Soviet troops on Ukraine and Germany” in 1941. “The federal government does not comment on the statements made by Prime Minister Yatsenyuk,” a spokesman for the cabinet of ministers said. On Friday, the Russian Foreign Ministry issued an official query to Berlin asking it to clarify the German government’s position on Yatsenyuk’s claims. “We sent a note to the German Foreign Ministry regarding Yatsenyuk’s extremist utterance, which falsifies history, and asked them to formulate an official position on it,” Deputy Foreign Minister Vladimir Titov said. Ukraine’s parliament appointed a new, pro-Western government that includes a U.S.-born finance minister to take on the job of staving off financial collapse, overhauling the shrinking economy and ending the armed conflict in the country’s east. After a chaotic day of rambling speeches, drawn-out questioning and last-minute horse trading Tuesday, the chamber by a large majority backed ministers proposed by a coalition of parties loyal to President Petro Poroshenko and Prime Minister Arseniy Yatsenyuk, who was reappointed last week. January 14, 2015 "ICH" - "NYO" - There were times in Ukraine’s recent history when even the country’s military brass were kneeling before the U.S. Literally. In June 2013, then-U.S. Ambassador to Ukraine John Tefft received the saber of the Ukrainian Cossack in the city of Kherson from a kneeling Ukrainian high-rank military official. Mr. Tefft nowadays is serving the country as an Ambassador to Russia where no such honors are even imaginable. By law, double citizenship is not permitted for a Ukrainian governmental official, but, as often happens in Ukraine, for some there is always another way around. The governor of Zaporozhe region, oligarch Igor Kolomoisky, for example, has three citizenships. Russia has sent more troops into Ukraine than at any time since the crisis began, deploying 9,000 soldiers inside its neighbour, according to the Ukrainian leader. Petro Poroshenko, the president of Ukraine, said Russia had also dispatched 500 tanks and other armoured vehicles over the border. A total of five Russian infantry battalions are now believed to be inside eastern Ukraine. Separatist rebels have controlled a large area of Donetsk and Luhansk regions since last summer. In the last week, however, Ukrainian forces have successfully counter-attacked, strengthening their grip on Sergei Prokofiev International Airport in Donetsk, only five miles from the separatist headquarters in the centre of the city. The latest Russian deployment appears to be a response to Kiev’s success. Whenever Ukraine’s troops have gained ground against the rebels, Russia has generally reacted by sending troops to reinforce the insurgents. Andrei Kostin, the head of VTB, reacted angrily when asked what the consequences would be if Russia were excluded from the Swift banking system, a secure means of moving money across borders. He said that if Russia were excluded from the Swift system, it would make the U.S.–Russia relationship akin to the U.S.–Iran one. He made the comments after noting that Russia had recently created its own alternative to Swift. Igor Shuvalov, a deputy prime minister and the head of Russia’s delegation to Davos, issued a stern warning to those who would imagine Russia without President Vladimir Putin. Both Kostin and Shuvalov lamented the current economic situation, which has seen Russia burn through its reserves as the ruble plummets. The ruble has lost almost 50% of its value in the past few months and Russia is facing recession following years of oil-fueled growth. Again, for BBC in Ukraine rebel areas "civilians killed"; in govt areas "killed by rebels"
How many authors could title their book simply World Order without sounding utterly presumptuous? Henry Kissinger still plays in a league of his own. For admirers and critics alike, he is more than just a former U.S. secretary of state and previous national security adviser. Some see him as the quintessential wise man of U.S. foreign policy; others, as a diehard realpolitiker hanging on to yesterday’s world; and still others, as a perennial bête noire. To all, he remains larger than life. And regardless of how one views Kissinger, his new book is tremendously valuable. To call World Order timely would be an understatement, for if there was one thing the world yearned for in 2014, it was order. In the Middle East, the Syrian civil war has killed hundreds of thousands and allowed jihadist groups to threaten the stability of the entire region. In Asia, an economically resurgent China has grown more assertive, stoking anxiety among its neighbors. In West Africa, the Ebola pandemic has nearly shut down several states. And even Europe, the most rule-bound and institutionalized part of the world, has seen its cherished liberal norms come under direct assault as Russian President Vladimir Putin reclaimed military aggression as an instrument of state policy. Even more ominous, the traditional guardians of global order seem to have become reluctant to defend it. Following long, costly wars in Afghanistan and Iraq, the United States and other Western powers are suffering from intervention fatigue, preferring instead to focus on domestic concerns. And the rising powers have so far proved either unwilling or unable to safeguard international stability. The body of journalist Sergei Dolgov was found in a park in eastern Ukraine. The editor of two Russian-language newspapers who was seized last month in eastern Ukraine and who was believed to have been held by Ukrainian government forces has been found dead, his colleague said in an online post. The body of Sergei Dolgov, who was an editor at newspapers Hochu v SSSR, or "I want to be in the USSR," and Vestnik Priazovya, or "The Azov Region Courier" was found in a park near the eastern Ukrainian city of Dnipropetrovsk, according to a message posted on the Vkontakte page of Konstantin Dolgov, the editor of Glagol online news portal. Konstatin Dolgov, who is also a leader of the pro-separatist People's Front of Novorossiya movement, added that his namesake had been "tortured" by kidnappers, saying "the enhanced interrogation ended in the death of the journalist." According to employees of Vestnik Priazovya, Dolgov had been missing since mid-June when masked men armed with automatic rifles barged into their editorial offices in the eastern Ukrainian town of Mariupol and abducted Dolgov, tying up his hands with wire, 24.com.ua reported. Serhiy Spasitel, the head of the Mariupol regional branch of Ukraine's Security Service, or SBU, said a few days later that Dolgov was alive and well, but that questions about his specific whereabouts should be addressed to Ukraine's Anti-Terror Center — the SBU agency in charge of combating the separatist movement in the country's east — i24.com.ua reported. Mariupol Prosecutor Serhiy Reznitsky also denied any knowledge of the supposed abduction, saying police and prosecutors "do not always know what is happening [at the Anti-Terror Center]" i24.com.ua reported. Oleksandr Kofman, a pro-Moscow activist in eastern Ukraine, accused government forces of killing Dolgov in retaliation for his political views. "He was a principled journalist who upheld a position that contradicted the view of the new Kiev government," Kofman was quoted as saying by Interfax. "Sergei's murder is another crime for which the representatives of the Kiev administration will receive their due punishment sooner or later." At least five foreign journalists — four Russians and one Italian — have been killed since the start of the conflict in eastern Ukraine, while a number of journalists have been detained or banned from entering the country in what some have dubbed a "war on information." 'All journalists run risks. Simon Ostrovsky is a brave guy, but he got away lightly compared to someone who isn't in the article above. He had been tortured by kidnappers, and "the enhanced interrogation ended in the death of the journalist." Probably because "He was a principled journalist who upheld a position that contradicted the view of the new Kiev government." The Guardian article covered preciselythe time frame of Sergei's abduction/death, Ist to 20th July 2014. Yet absolutely no mention of this brutal State crime. 'Journalists working in Ukraine are being intimidated on a daily basis, and not only in the country's eastern region. Both pro-Russian separatists and anti-Russian Ukrainian groups are responsible. Life is also tough for Ukrainian journalists who try to work inside Russia. Here is a catalogue of incidents so far this month involving the media, courtesy of a summary compiled by the Paris-based press freedom watchdog, Reporters Without Borders, and reports on the website of the New York-based Committee to Protect Journalists. On 20 July, pro-Russian separatists detained 10 journalists outside the morgue in Donetsk while reporting on the aftermath of the MH17 tragedy. They included Kevin Bishop, a BBC reporter, Anna Nemtsova, a Russian reporter for the Daily Beast, Simon Shuster, a US reporter for Time magazine, Italian journalist Lucia Sgueglia, and two reporters for the Swedish daily Dagens Nyheter, Paul Hansen and Jan Lewenhagen. On 18 July, Ukrainian reporter Yevgeny Agarkov, who works for channel 2+2, was convicted of "working illegally as a journalist" in Voronezh, in southwestern Russia. He was sentenced to spend 10 days in solitary confinement and ordered to pay a small fine (£30). He will then be expelled from Russia and banned from the entering country for five years. Immigration officials told the administrative court that Agarkov was not accredited by the Russian foreign ministry. He went to Voronezh to cover the case of Nadezhda Savchenko, a Ukrainian pilot who is being held for alleged complicity in the deaths of Russian journalists Igor Kornelyuk and Anton Voloshin, who were killed by mortar fire in eastern Ukraine on 17 June. On 17 July, police in Ukraine's capital, Kiev, received anonymous hoax messages about bombs having been planted in the offices of two national TV stations. Searches of Inter and 5 Kanal, which is owned by President Petro Poroshenko, proved fruitless. It was the third false bomb alert at 5 Kanal in July. On 11 July, the Institute of Mass Information (IMI), a Ukrainian organisation partnered with Reporters Without Borders, released figures for media freedom violations during the first half of 2014. According to its tally, six journalists were killed in connection with their work; 249 were injured or attacked; and at least 55 were taken hostage or detained. IMI's director, Oksana Romanyuk, said: "Physical attacks against journalists and other media workers currently pose one of the main challenges for the media profession... Ending impunity and defending the public's right to information should be one of the main items on the new president's agenda." On 10 July, pro-Russian rebels seized all the computer equipment and video cameras from the offices of the Luhansk-based news website Politika 2.0. Its editor, Serhiy Sakadynski, said the raid took place after a Politika 2.0 reporter was accused by separatists of spying because she took photos of Luhansk railway station. Sakadynski was beaten up during the raid and detained by the gang. They released him the following day after "influential persons" intervened. The equipment was not returned. On 10 July, a Luhansk-based TV station, Luhansk Cable Television (LKT), announced that it had suspended broadcasting because it could no longer guarantee the safety of employees. The station's owner told employees he was placing them all on leave until further notice. The wife of LKT's legal adviser, Igor Zazimnik, was killed by a stray bullet on the balcony of her apartment the same day. Two other local TV broadcasters, IRTA and LOT, have also had to suspend operations. On 8 July, a TV crew working for the Ukrainian national TV channel, Inter, came under mortar fire in a village near Luhansk. Reporter Roman Bochkala was taken to hospital after breaking his arm while scrambling for shelter. His cameraman, Vasyl Menovshchikov, was unhurt. They were covering operations by the Ukrainian army's 30th regiment in which two soldiers were killed. On 5 July, about 50 masked men attacked the Kiev headquarters of the Russian-language newspaper Vesti. They pelted it with stones and set off teargas. Responsibility for the attack was claimed by Oles Vakhni, an ultra-nationalist who served a six-year jail term on charges of armed robbery and violence. Vesti's owner, Igor Guzhva, linked the incident to a demonstration staged outside the newspaper the week before with the aim of "ending the dissemination of anti-Ukrainian propaganda." On 4 July, armed separatists in combat fatigues representing the self-proclaimed People's Republic of Luhansk stormed the headquarters of the Luhansk region's state radio and TV broadcaster. After they had taken control of the premises, one of the rebels said the broadcaster's various channels were now "closed" and would remain so until they resumed "under a different format." The previous week, local cable TV operators, LKT and Triolan, replaced most of their Ukrainian TV news channels with Russian alternatives. On 2 July, two TV journalists working for Ukraine's citizen channel, Hromadske, were released after being held for two days by separatists. Reporter Anastasia Stanko and her cameraman, Ilya Beskorovayny, had paid money to a "security unit", which promised to protect them. But they were detained by another unit. They were accused of spying and threatened with decapitation. On 1 July, Denis Kulaga, a staff reporter with Russia's REN-TV, and his cameraman, Vadim Yudin, were treated for shock in hospital after a mortar shell exploded close to them while they were reporting near the Russian border. Have you not heard of the clear-cut murder by Ukrainian 'Security' agency the SBU of Sergei Dolgov? When I searched your site, there was no mention of him. As NATO-backed protests were beginning to take off in Ukraine after then-president Viktor Yanukovich agreed to accept a financial deal with Russia as opposed to the greater integration/austerity package proposed by the European Union, evidence of US involvement in the Euromaidan color revolution began to surface in the Ukrainian Rada. Indeed, early on, there were individuals in the Ukrainian government who recognized that there was an international and NATO-centered plot at work in their country designed to overthrow the President and other elected officials using “swarming adolescents” and other more violent elements of protest and destabilization. While color revolutions are often manifested through a variety of channels -- the National Endowment for Democracy, USAID, IRI, NDI, are just a few examples, -- there were a number of relatively new participants in the game of national destabilization at play in Ukraine this time around. For instance, even something as a seemingly innocuous “TechCamp” acted as a front for the color revolution apparatus in Ukraine. While the “TechCamp” concept is one that is presented as bringing influential and important members of the public together with members of the technology community for the purposes of greater training and understanding, the truth is that these “TechCamps” are actually operations used to disseminate methodologies for the implementation of color revolutions throughout the target country. This was recognized early on by Oleg Tsarev, former Deputy of Ukraine and now a member of the separatist parliament in Eastern Ukraine. In November, 2013, before he was ousted from his position in the Ukrainian government, Tsarev attempted to warn the Rada of the involvement of the West with the protests taking off in Ukraine and the use of the “TechCamp” as a tool of destabilization. This is an excerpt of an extended article by Brandon Turbeville. Maidan Massacre is an investigative documentary into the shootings which occurred on February 20th, 2014, when nearly 50 people were gunned down on the streets of Kiev's Independence square. The massacre was the result of a massive three month long protest against the former Government of Viktor Yanukovich and his decision to reject a trade deal with the EU. Although no thorough investigation had been conducted, the blame was immediately placed on the officers who served under Yanukovich. This program investigates the scene of the crime, interviewing those who were there when the shootings occurred, and seeks to answer the questions as to who really was shooting that day on Kiev's Independence square - a place known to the people of Ukraine, as Maidan. 'A Reuters examination of Ukraine's probes into February’s Maidan shootings, which left over 100 dead and nearly a thousand injured, uncovered 'serious flaws' in the case against Berkut officers, arrested by the country's officials. The research, carried out by journalists, is based on interviews with prosecutors, defense attorneys, protesters, police officers and legal experts. It studies the case of officers from an elite riot police unit - Berkut - who have been arrested as Maidan sniper shooting suspects. A 38 years-old unit commander Dmitry Sadovnik was detained in April and accused of ordering his men to fire at the crowd of protesters in Kiev on February 20. Two younger officers, Sergey Zinchenko and Pavel Abroskin were also arrested. The three men are charged with a massacre of 39 unarmed protesters. The probes into the killings have been hindered by missing evidence, Reuters reports. According to its investigation, many guns allegedly used to shoot protesters have vanished, as well as the bullets. Barricades, bullet-pierced trees and other items of forensic evidence were removed, lawyers say. Court filings in the cases are not public, so the extent of the prosecution’s evidence is unclear. Among what has been unveiled in the Sadovnik case is a photograph, allegedly showing him near the crime scene, wearing a mask and holding a rifle with two hands, "his fingers clearly visible," the report says. But, as Reuters points out, the man has only one hand, as his other one was blown off by a grenade in a training accident six years ago. Sadovnik demonstrated his stump at a courtroom. "He can’t really shoot, to blame him for the crime is a political game," Sergey Vilkov, Sadovnik’s lawyer said, as quoted by Reuters. Prosecutors did not even give the arrested suspects the benefit of the doubt. Oleg Makhnitsky, a former acting general prosecutor who oversaw the arrests of the three Berkut officers, declared on television that they "have already been shown to be guilty" - a statement that could prejudice the cases, according to legal experts, and is a violation of the European Convention on Human Rights. Another gap in the investigation, according to the research, is the fact that "no one has been apprehended in the shooting of policemen," although, according to Ukraine’s Ministry of Interior Affairs, almost 200 police officers were injured with gunshots and 13 died between February 18 and 20. But the prosecutors "represent the whole picture as a peaceful protest," Reuters quotes Sadovnik having told a judge at a hearing. In April, ex-Ukrainian Interior Minister Vitaly Zakharchenko said Berkut riot police were targets and not shooters during the Maidan standoff. He added that a fair investigation of the tragic events in Kiev was impossible under the biased, coup-imposed government. Family members of some of the Maidan victims also question the way the proceedings were held. "The investigation does not have enough evidence to prove the guilt of these three people," Vladimir Bondarchuk, the son of one of the men who were shot dead on February 20, said. Bondarchuk helped organize an association of about 70 families of dead protesters aiming for "an objective and accurate investigation," Reuters reports. In September, Dmitry Sadovnik went missing after he was released from pre-trial detainment by the court and put under house arrest. According to the prosecutor's statement, the suspect escaped "aiming to avoid punishment." The journalistic investigation says the former unit commander "was being framed, and saw flight as his best option." He called the case against him "a political lynching," and in the days before he vanished, his family received death threats, Reuters reports, based on the suspect's wife’s and lawyer’s statements. Another two suspects remain in jail with no trial date set. All three face life imprisonment. Several earlier reports stated that snipers who killed dozens of people during the violent unrest in Kiev in February operated from a building controlled by the protesters on Maidan square. The allegations have been confirmed by former chief of Ukraine’s Security Service Aleksandr Yakimenko. 'Former chief of Ukraine’s Security Service has confirmed allegations that snipers who killed dozens of people during the violent unrest in Kiev operated from a building controlled by the opposition on Maidan square. Furthermore the former security chief believes that Parubiy has been in contact with US Special Forces that could have coordinated the assault. “Shots came from the Philharmonic Hall. Maidan Commandant Parubiy was responsible for this building. Snipers and people with automatic weapons were ‘working’ from this building on February 20. They supported the assault on the Interior Ministry forces on the ground who were already demoralized and have, in fact, fled,” Yakimenko said in an interview with Russian television. 1hr 37mins video; US proxy Nazis at work, bombarding cities and villages. 'Over the last 15 months Ukrainians have paid for Washington’s overthrow of their elected government in deaths, dismemberment of their country, and broken economic and political relationships with Russia that cost Ukraine its subsidized energy. Now Ukrainians are losing their pensions and traditional support payments. The Ukrainian population is headed for the graveyard. No money for pensions, plenty for arms to murder and terrorise. 'The price of the warfare resumed by President Petro Poroshhenko in the east is terrifying. The hacked documents claim at least 1,100 servicemen of the Ukrainian army have lost their lives over the period of the last two weeks. Many dozens Ukrainian soldiers gave up to rebel forces. Ukrainian army has lost over 100 tanks and the armored vehicles. This information comes into collision with the latest reports by Kiev generals about “no losses”, “defeated enemy” and “thousands of eliminated terrorists”. The explanation to this is simple: according to the documents allegedly hacked, Ukraine's Security Service (SBU) has officially forbidden the Defense Ministry to reveal true casualties among servicemen. CyberBerkut has accused Ukrainian commanders of defecting, leaving their subordinates on the battlefield. The zone along the frontline is full of prowling deserters and blood-thirsty psychopaths dressed up in Ukrainian uniforms, claims the group. The guy being interviewed seems pretty clued-up; the scenario he paints is not a happy one. There are so many flash-points around the globe now, something has to blow up big-time, and it won't be long. The conflict in southeastern Ukraine can escalate at any time, representative of the self-proclaimed Donetsk People’s Republic (DPR) at the Minsk peace talks Denis Pushilin said Sunday, pointing to a threat of a major war between Kiev forces and independence supporters amid a ceasefire enforced in the region. DONETSK (Sputnik) – Kiev forces launched a military operation against independence supporters in the Donetsk and Lugansk regions in April 2014. In February the two sides signed a ceasefire deal, but sporadic fighting has continued in Donbass despite the agreement. "We are actually on the brink of a major war right now. Our conflict is not an internal Ukrainian one, it is fully in line with what is happening in Syria, Yemen, the uprising in Macedonia,… and could lead to very tragic consequences and, as a result, things can escalate in a matter of hours." Pushilin told RIA Novosti that the stance of the international community on the Donbass conflict could determine whether fighting in Ukraine’s southeast would finally stop. "Some major developing countries are giving a certain signal even through their neutrality and non-interference [in the conflict], that they are not supporting a military solution, they are for the continuation of the peace process. A singe decision that seemingly has no influence on anything could become critical and tip the scales one way or another." The West and Kiev have been accusing Russia of fueling the conflict in Ukraine’s southeast, although the claims have not been supported with any factual evidence. Moscow has repeatedly stressed that it is not involved in the conflict and has participated in various formats of Ukraine peace talks. Kiev has nonetheless continued to ask Western governments, particularly the United States for military assistance amid sporadic fighting in Ukraine’s southeast. US President Barack Obama has not approved lethal aid to Kiev, although Congress has been pressing Washington to allow lethal weaponry supplies to Ukraine’s government. "The incompetent political and economic structure of the country is evident. Here war is a kind of cover for a lack of professionalism, a lack of autonomy in decision making." Pushilin added that the conflict in Donbass could go on for dozens of years. "It is not that we will be under fire for 10 years. What’s meant here is whether a full solution on political issues will be found in the conflict. This can take a very long time. This process is unpredictable," Pushilin explained. According to Pushilin, the DPR is doing everything to bring an end to shelling in southeastern Ukraine. "What is most important for us now is the issue of the ‘all-for-all’ [prisoner] exchange and the presence of some representatives from the other side who do not consider it necessary to intensify the prisoner exchange process in the agreed ‘all-for-all’ format, they are trying to find some other ways and are slowing down [the process] with their actions," Denis Pushilin told RIA Novosti. The DPR negotiator stressed that the prisoner swaps was the main issue of discussion among members of the humanitarian subgroup of the Contact Group on Ukraine, which includes representatives from Kiev, the self-proclaimed people’s republics of Donetsk and Lugansk, Moscow and the Organization for Security and Co-operation in Europe (OSCE). A series of subgroup meetings have been held since early 2015 to make sure that both Kiev and DPR and LPR are moving forward in implementing the Minsk peace agreement, reached in February. The lifting of the economic blockade imposed on Donbass by Ukrainian President Petro Poroshenko amid fighting between Kiev forces and local independence supporters will top the agenda at the upcoming talks in Minsk, the DPR envoy said. "The lifting of the economic blockade," Pushilin said when asked about the key issues to be discussed during the talks. An economic subgroup of the Contact Group on Ukraine is scheduled to meet in the Belarusian capital on June 23. I am new to this forum, so let me first state my position on 9/11 and on some other topics popular here. With 9/11 it's pretty simple. The evidence of controlled demolition of all 3 towers and especially building 7 is overwhelming. Given that building 7 was pretty secure, I have no other option but to conclude 9/11 was an inside job. On other issues however (7/7, NWO, etc) my position ranges from "suspicious but lacking evidence" to "I don't see any problems with the official version". Most of those other issues I have no interest in, with the notable exception being the situation in Ukraine. I've been following it closely for a long time, and I have to say my conclusions are completely different from those dominant in the 9/11 community. So, let's discuss the situation in Ukraine, shall we? Before I start, let me point out that I am an ethnic Russian with no connections to Ukraine. I am an EU citizen and the resident of UK. Russian is my native language and Ukrainian I understand to some extent, due to its similarity with Russian. Now to the main topic. Instead of making some broad claim that would be hard to substantiate, I'll make a small claim that I am going to prove. The claim is: Russia does send both troops and weapons to Ukraine. Of course, officially Russia denies it. If we can agree they are lying, it would cast a very serious doubt on anything else Russia claims, be it official statements or claims made on RT (which is state owned). Before we get to my main claim, let me just point out that Putin is not your friend. In fact, back in 1999 he pulled off something very similar to 9/11. Several apartment blocks were blown up, killing almost 300 people. This was used as a pretext to start the 2nd Chechen war. Additionally, it boosted Putin's popularity, which resulted in his election as Russian President half a year later. At the time of the bombings he was a prime minister. Why do I think those bombings were an inside job? Well, because one of those bombings was prevented. Local residents noticed suspicious people unloading heavy sacks into the basement of their building. That's how the other buildings were blown up - sacks with explosives. So, people called the police, who came and disarmed the bomb. The minister of interior affairs (effectively the chief of police) congratulated the local police (in Russian, sorry) with preventing a terrorist act. The next day the local police found those people who were unloading the sacks, checked their phone records, and discovered they had received calls from FSB. At this point the FSB breaks silence and claims: Yes, these are our people, but no, it wasn't a terrorist act. It was an exercise to test vigilance of the local police. Now on to my main claim. The Russian weapons and troops in Ukraine. The evidence is plentiful, but let me just present the strongest cases. 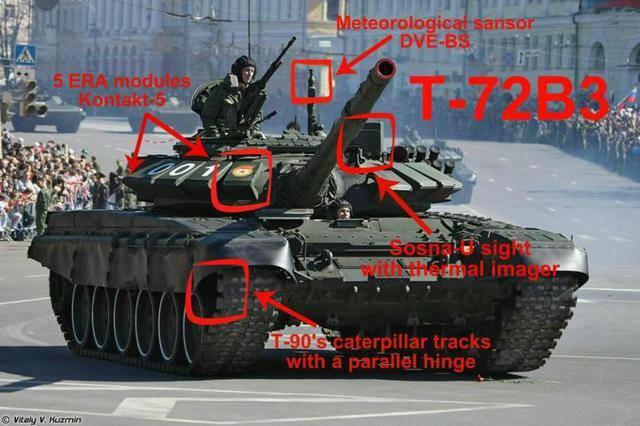 If you watch carefully, the unique features of T72-B3 tank are visible on all of the above photos and videos. These tanks are not supposed to be in Ukraine at all! Now what about the presence of Russian troops in Ukraine? These 10 were captured in August 2014. These two - in May 2015. Other videos to watch: one, two, three. The evidence I laid above is not the only evidence of Russian weapons and troops in Ukraine, yet it's probably the strongest evidence. Let's leave it at that for now. If you disagree with my claim that Russia supplies both weapons and troops to Ukraine, I am willing to discuss it.